This review first appeared in the March 29, 1996 issue of the North County Times. OK, so you've never heard of Jay Owens, and you consider yourself quite the blueshound. Don't be too hard on yourself, though; this is, after all, only his second album. Still, he's not some kid. Nearly 50 years of age, Owens has been knocking around for a while, waiting for a chance. Now that opportunity has finally knocked at his door, he's taking full advantage of it. 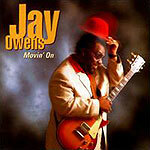 In the mold of a Little Milton or Johnny Taylor, Owens' music encompasses blues, R&B, soul and jazz  and even some reggae. His singing gets equal play with his sharp guitar; best of all, his songs are melodic, addictive. Not possessed of a great voice, Owens' singing is nevertheless tremendously expressive. His guitar playing is more in a T-Bone Walker vein than Albert Collins  restraint is his guide. It is that very sense of restraint  of sophistication and taste  that marks Jay Owens as an artist whose late arrival was worth waiting for.